Another fight, another major titlist conquered by Katie Taylor. The two-time Olympian from Ireland – who captured a Gold medal in 2012 – has now collected her third lightweight belt following a 9th round stoppage of Brazil’s Rose Volante in their unification bout Friday evening at Liacouras Center in Philadelphia, Pennsylvania. Taylor had been forced to go the scorecards in five of her previous six starts, leading some to believe she lacks punching power at the championship level. That perception was put to rest less than a minute into an opening round, after Taylor connected with a left hook to put Volante on the canvas for the first time in her career. It would serve as the lone knockdown of the contest, only because Volante – very aggressive early – fought with far more caution with each passing round. Taylor did her best to force an action fight but settled for winning rounds in dominant fashion. The best shot at a stoppage came in round five, when Taylor sensed her opponent was hurt and went on the attack. Digging body shots and right hands upstairs had Volante on the brink, but not quite ready to concede her title or unbeaten record. As much was evident in her work rate, as Volante actually threw more punches than Taylor in the majority of the rounds. Connecting on those shots was another story entirely, as Taylor was frighteningly more active. 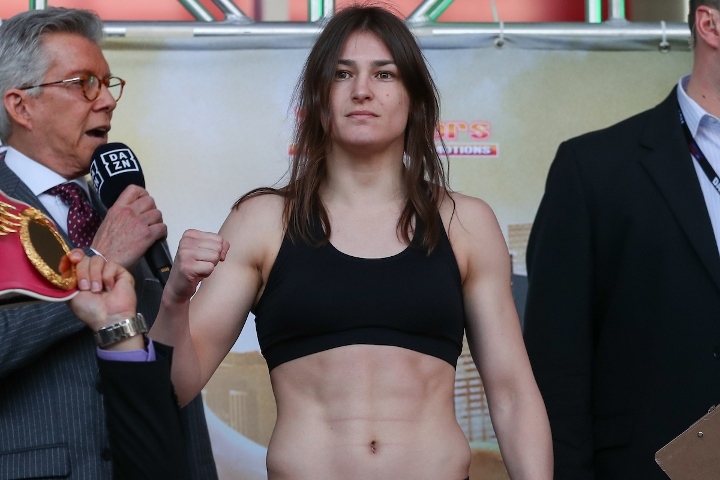 A power surge in round eight once again had Volante in trouble, but the previously unbeaten Brazilian was able to remain on her feet and – when the moment presented itself – fight back. Even in the early moments of round nine where Volante was able to get off her shots, Taylor was able to return in rapid fire succession. The flow of the contest warranted a stoppage, but the manner in which was produced was a bit anti-climactic. An inadvertent clash of heads left Volante with a cut on the bridge of her nose, and her state of injury was enough to convince referee Benjy Esteves to end the night, upending Volante (14-1, 8KOs) in her U.S. debut, along with a title reign which lasted just under 15 months. Taylor rolls to 13-0 (KOs) with the win, collecting her third title at lightweight and now with her sights firmly set on becoming undisputed champion. Her win comes one week after Belgium’s Delfine Persoon (43-1, 18KOs) defended her WBC lightweight title in a 7th round knockout of Melissa St. Vil. “Now we can start talking about that fight with Persoon,” notes Taylor, who is also being groomed for a pound-for-pound showdown with seven-division titlist Amanda Serrano later this year. Preliminary plans call for an undisputed lightweight championship showdown on the June 1 undercard of undefeated, unified heavyweight titlist Anthony Joshua’s U.S. debut versus unbeaten Jarrell Miller at Madison Square Garden.